The first thing you see when after you take off your shoes at Toji-in temple is a huge daruma painting at the end of a long wooden corridor. The comical rendition of a seemingly grumpy Bhodidharma, with eyes wide open, surprises and and reliefs some of the heavy, solemn atmosphere one expects when entering a temple. The high contrast of white, red and black certainly made an impression on my the first time I visited the temple in 2012. This time, I was looking forward to see the Daruma again. The Japanese call the legendary Buddhist monk Daruma (達磨 or だるま) after the Indian short form Dharma for Bodhidharma. He is attributed to have brought Ch’an Buddhism from India to China in the 5th or 6th century BC. Ch’an will later make its way to Japan and be known as Zen. 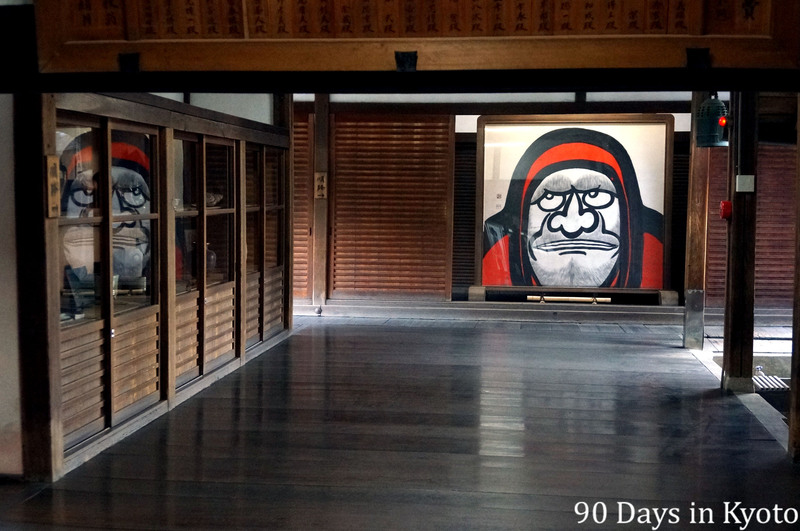 The most famous Daruma painting in the main hall way of Toji-in. There are many legends around this religious figure. 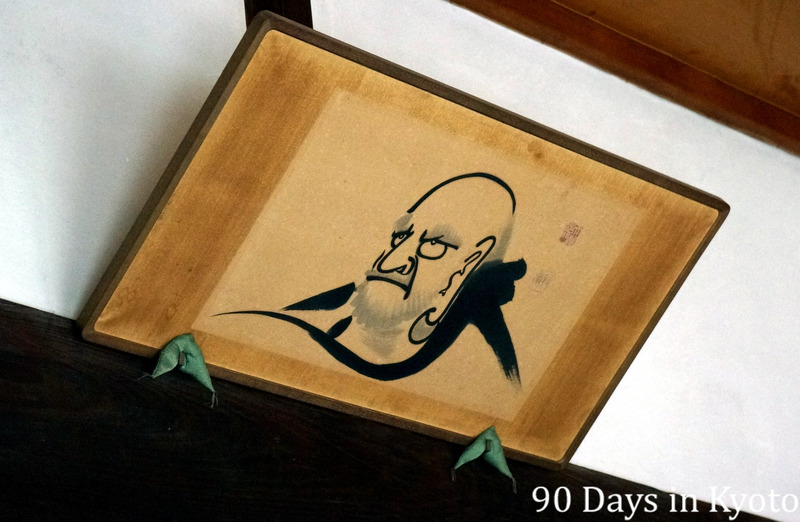 He is especially famous for sitting 9 years in meditation, facing a wall. 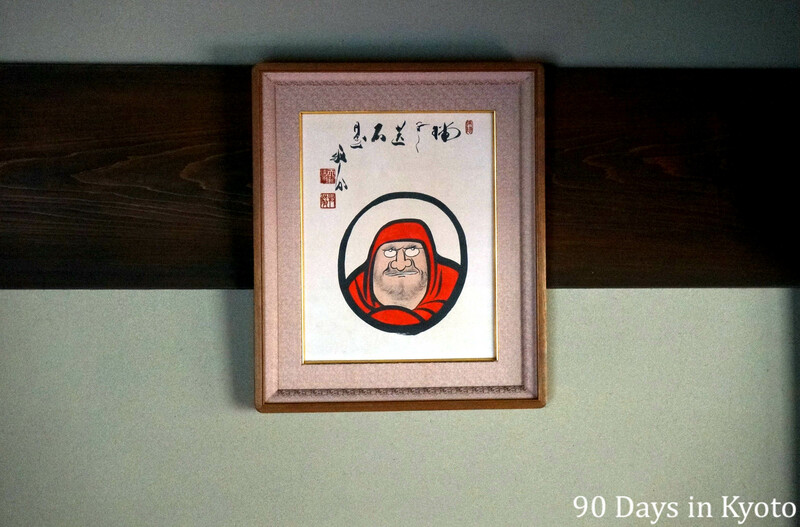 Daruma was well into his 7th year of sitting, when he got tired and fell asleep. When he awoke, he was mad and dissappointed that he fell asleep – so he cut of his eyelids, so this could never happen again. Legend goes that shoots of a tea plant grew where his eyelids touched the ground – since that time monks drink green tea to stay energized and awake during meditation. Read more about the life of the first Zen monk on wikipedia. 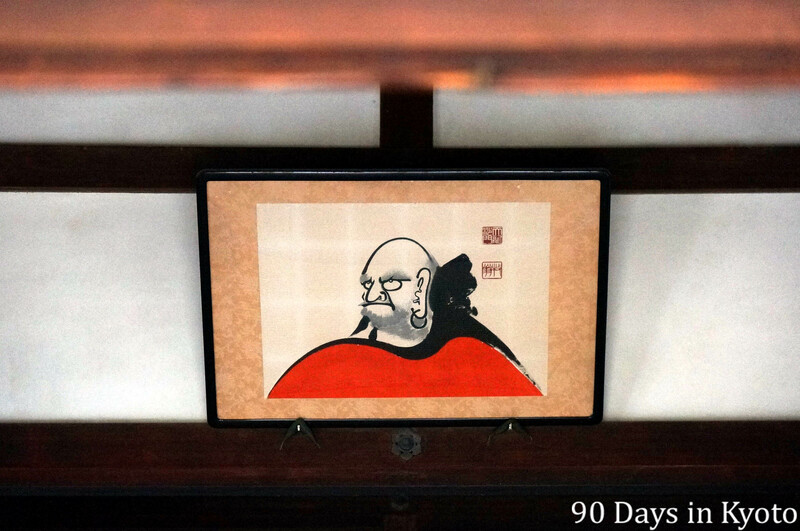 I found more daruma paintings in the different rooms of the temple – it was like searching for easter eggs. 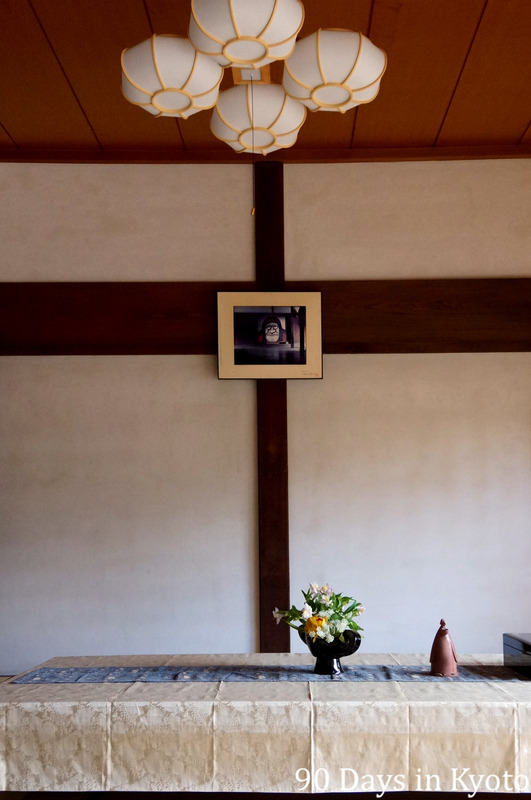 The last Daruma in the temple is also the first one – a small photograph of the big Daruma in a reception room near the entrance/exit. I wasn’t aware of the picture when I entered the temple, but the easter egg hunt was… dare I say… a real eyeopener.